The bodyguards are in the employ of the same security company of the two men who were guarding ANC in eThekwini secretary Bheki Ntuli. Three KwaZulu-Natal-based bodyguards will appear at the Durban Magistrates’ Court on Wednesday for unlawful possession of firearms, according to Police Minister Fikile Mbalula. “The three are bodyguards for Mandeni Local Municipality Mayor, Sphesihle Basil Zulu. Coincidentally, these three bodyguards are in the employ of the same security company of the two men who were guarding the regional secretary of the African National Congress in eThekwini region, with their video of them showing off their firearms going viral,” Mbalula said in a statement released on Tuesday night. He said that four pistols, one rifle and live rounds of ammunition were seized and had been sent for ballistics testing to determine if they had been used in any crime. 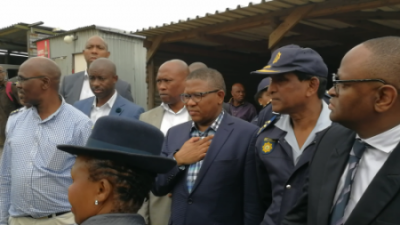 Mbalula has come down hard on private security companies in the wake of dozens of political killings in KwaZulu-Natal. While on an inspection at the notorious Glebelands hostel complex in uMlazi last week, he said these companies posed a danger to society and were in urgent need of regulation. “Criminals have found a loophole in having access to weapons through registering security companies in South Africa. The private security industry regulatory authority, which is under my ministry, has been instructed to do a nationwide audit of the security companies that offer close protection services, also called bodyguards,” he told journalists at Glebelands on Friday. According to Tuesday night’s statement, Hawks members from Durban’s Organised Crime (National Bureau for Illegal Firearms Crimes and Priority Violent Crimes) and National Intervention Unit members arrested the bodyguards. “I have engaged with [the] Private Security Industry Regulatory Authority (PSIRA) who are the custodian of security companies in our country, surely we can’t have security companies who have employees who are the law unto themselves? I need answers from PSIRA on what action they will take against this security company,” said Mbalula. “People must understand that guns have caused many heartaches in many families and brandishing of guns cannot be tolerated, I sincerely hope that people will desist showing off their guns and endangering society,” he said.